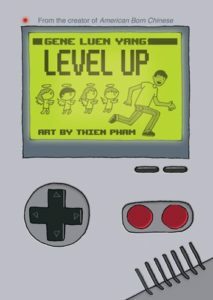 Graphic Novel Review 48/365: Level Up – First Second Week! Like most folks, my first exposure to Gene Luen Yang was through the award-winning American Born Chinese, and also, like most reader-mined folks, when I find a book that I like, I seek out other works from that author. And that lead me right to Level UP. As a very part-time video-gamer, the cover of the book grabbed me, and I had it done in an hour after I got it home from the store. This book is not about video games…but it is. Our protagonist, Dennis, struggles to find himself after the death of his father. Dennis, thinking that he must become a doctor to appease the literal ghosts of his father (that take the shape of angels from a card that his father once gave him), gives up his life as a gamer and begins a relationship with med school. The video game metaphor works well in the book mainly through the “lives” that Dennis gets and loses moving through the “Levels” of his life; the chapters are also named by “Levels.” This book is perfect for any smart young person that has grown up in the video game culture that is having a difficult time figuring out life and the many curve balls it throws at us. We learn, with Dennis, that the path to who we are is often not a straight line. I love the art in this book. I’ve mentioned before that I’m a fan of water-colored graphic novels, and the subtle water-colored panels in Level UP work for me. We have monochromatic blues and grays for flashbacks and heavier moments in Dennis’ life, and splashes of color from keeping it from getting too dark. Most of the backgrounds of the traditional six-panel page layouts are plain, allowing the reader to focus on the main subject of each panel, and there is never too much going on within the art to confuse the reader in any way. In a lot of ways, this would be a great first graphic novel to give to a new comics reader. There is no struggle reading this novel. Check this one out peeps. Gene Luen Yang is an amazing story-teller, and Thien Pham’s art pairs very well with Gene’s script. Have a niece or nephew, son or daughter that’s having a hard time deciding what to do with their life? Hand them this, and have a chat with them about it!